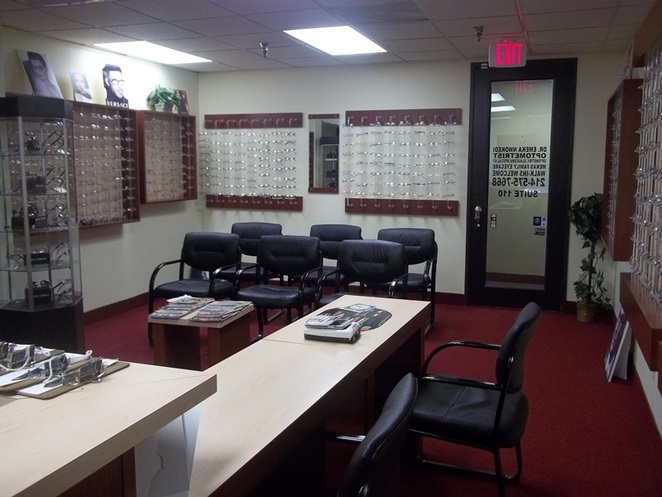 We have on display about 2000 ophthalmic frames in our boutique. We carry name brands such as Versace, Dolce & Gabbana, Vogue, Gucci, Christie Brinkley, Geoffrey Beene, Van Heusen, Jacob Daniel and Mario Martinelli. Other premium frames we carry include Mandalay, XXL, Jalapenos, Kiki, Atia Titanium, Whispers, Alexander collections, New Globe and Pez. If you want bendable frames, we have for you Bendatwist and Hagger. Bendable frames for kids include Bendatwist and NG 180's. Sports and safety eyewear frames include Leader, RX Sports and A2. If you are interested in any of our frames, please feel free to visit or call us at (214) 575-7668.